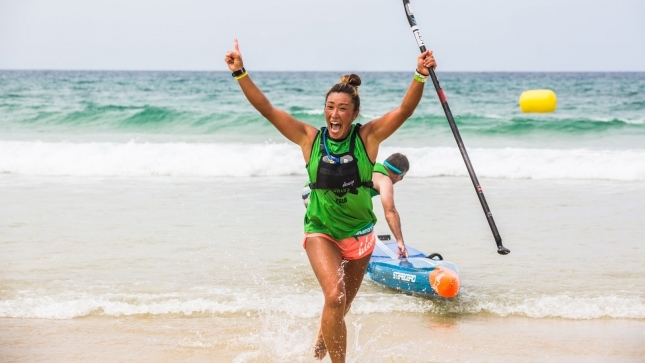 Michael Booth and Yuka Sato picked up a bag full of pre-season Paddle League points on the Gold Coast this weekend, with the Starboard duo overcoming a hot field and even hotter conditions to salute at the 7th Annual 12 Towers Ocean Race. Boothy overpowered world number two Titouan Puyo (NSP/QB) and fast-finishing Lincoln dews (DEEP/QB), while Yuka stunned the strong Aussie women led by dark horse Kate Baker (ONE) and international star Terrene Black (ECS/QB). With dead calm winds greeting the 236 paddlers early Saturday morning, race organisers had to switch to plan B and reverse the course. The northerly “devil’s wind” picked up just enough during the race to make drafting difficult but still not produce the Gold Coast’s signature downwind bumps. In other words: it was a grind. After a deep water ocean start, which could only be described as “rolling” (good luck getting 200+ paddlers to line up straight), the pre-race favourites immediately set a pace that nobody else could match. Boothy took an inside line closer to the coast, while Titou battled in a virtual stroke-for-stroke dogfight 500 metres further out to sea. It would stay this way for much of the 15km course, before the two converged in the closing stages to reveal the Aussie had a 100 metre lead that he was never going to relinquish. 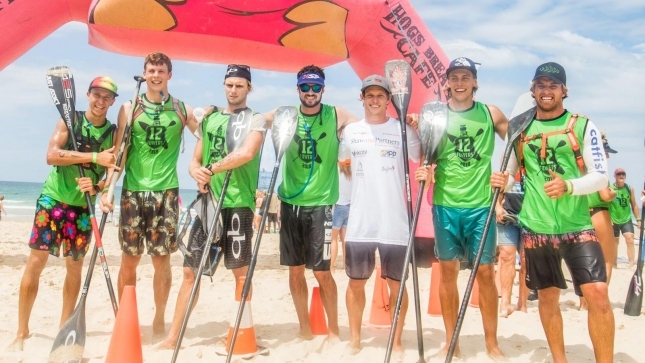 The reigning EuroTour champion crossed the line all smiles to claim his third 12 Towers title and in the process earned himself 40 points on the new-look Paddle League World Rankings (an evolution of the old SUP Racer World Ranking). Titouan wasn’t far behind though, and the New Caledonian showed more than enough fight to suggest 2018 will be the most exciting race season yet as the big guns battle for The Paddle League championship title. As always, the humble star was understated with his own performance but looked confident going into the new season. Behind the big three, there were plenty of fine performances throughout the 12 Towers field. New Zealand national champion Marcus Hansen looks to have recovered from his rollercoaster results in 2017 — the NSP/QB team rider was sitting in the virtual bronze medal position for most of the race before finally being reeled in by the determined Dews. Lincoln finished season 2017 with a bang – famously going toe-to-toe with Connor Baxter at the PPGs – and looks to be in great form both physically and mentally heading into the new year. Another fine performance came from New Caledonian junior star Noic “Chicken” Garioud, with the 16-year-old from Team Sunova showing he’s not just a one-trick pony. 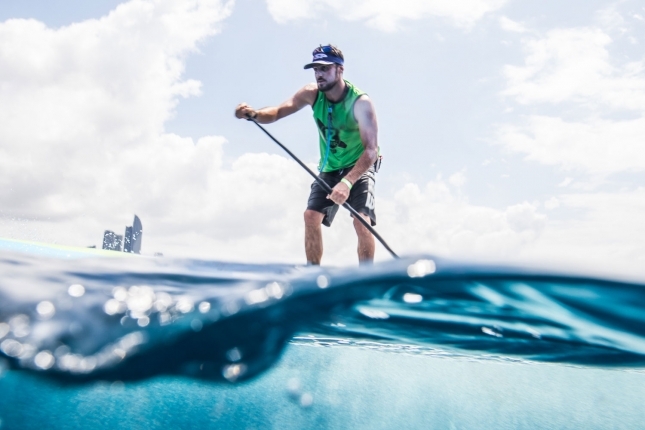 Famed for his downwind skills, Noic was forced to paddle a flat water board but still held his own against more than a dozen of the world’s best. Close behind were fellow young guns Clement Colmas (Starboard/New Caledonia) and the Peruvian Prince Itzel Delgado (Infinity/QB), while the fact that big names like Matt Nottage and Kenny Kaneko couldn’t even crack the top 10 highlighted the quality of the field (and difficulty of the conditions) in Australia’s biggest ocean race. But the real story of the day was Yuka Sato’s dominance of the women’s field. Still a relative unknown on the international scene, Yuka led from start to finish despite having to contend with both a strong local field and sweltering Queensland sun. The win gave Starboard a double victory and a sense of déjà vu, while Yuka made it clear that the established order of the women’s racing is due for a bit of a shake-up. Aussie dark horse Kate Baker worked hard the whole day and earned local brand ONE the second step on the podium, holding off Team Australia rep Terrene Black by a few seconds despite a panic-inducing fall at the first and final buoy turn of the course just 100 metres from the finish. Kate’s ONE team mate and pre-race favourite Angie Jackson was a casualty of the extreme temperatures — Angie limped home in sixth after nearly fainting mid-race. It was a United Nations podium in the juniors, with Sam McCullough from Western Australia wedging himself in between young New Caledonian star Noic Garioud and Japan’s new name to watch, 14-year-old Rai Taguchi. The 7th Annual edition of the 12 Towers attracted 236 competitors in its biggest year yet, and despite the draining conditions, there were plenty of smiles at the finish line as paddlers of all levels enjoyed a hot day on the water. The Paddle League pre-season continues on March 24/25 with a California/France/New Zealand triple-header weekend, before the international season kicks into gear with the first official Paddle League World Tour event in Tahiti on April 7. Follow ‘The Paddle League’ on Facebook and @paddleleague on Instagram for more coverage, and visit PaddleLeague.com/welcome to find out what it’s all about.